An arm lift, technically called a brachioplasty, is a surgical procedure that reshapes the under portion of the upper arm, from the underarm region to the elbow. 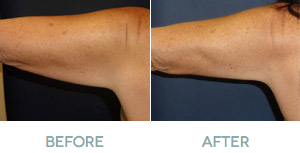 An arm lift procedure helps Kansas City patients achieve smoother skin and more attractive contours. In addition, any localized pockets of fat in the upper arm region may be reduced in conjunction with liposuction. The conditions treated with an arm lift are often caused by loss of elasticity in the skin and underlying tissue of the upper arm. Significant weight loss, aging, and/or heredity can result in skin that has been so stretched that it loses the ability to retract and cannot be corrected by weight loss. We perform arm lift surgery for our Kansas City patients as an extremely individualized procedure. An arm lift should be considered for your own personal reasons, not the desire of others. If you’re curious about how an arm lift may help tone and enhance your physique, request a consultation online, or give our office a call at (913) 451-3722. Your arm lift process will begin with a consultation with one of our board-certified surgeons. During your consultation, you’ll be asked many questions to ensure you are a good candidate for an arm lift procedure. Be ready to discuss your health history, as well as likely outcomes and potential risks related to your surgery. You may be asked to undergo lab testing or a mammogram (when age appropriate) as part of procedure preparation. Your arm lift will be performed at a licensed surgical center within the Kansas City metropolitan area. How do I know whether I’m a good candidate for an arm lift? We recommend that prospective patients be nonsmokers who are in good health. Patients should have positive outlooks with specific and realistic goals in mind for improving their images. What is the recovery process after arm lift surgery? Following all of your surgeon’s instructions is essential to a successful recovery. You’ll need a trusted loved one to drive you to and from your surgery, as well as stay with you throughout the first night. Discomfort is common following an arm lift but can be managed with prescription pain medication. Dressing or bandages will be applied to your incisions, and your arms may be wrapped in elastic bandages to help minimize swelling and support your body as you heal. You will be instructed to keep your arms elevated for several days following surgery. Our surgeons encourage light walking during the first several days of recovery in order to minimize complications. You should avoid heavy lifting and vigorous exercise for up to several weeks after your procedure. You will be permitted to return to work and other everyday activities within a few days, provided you are relatively sedentary. Patient experiences vary after arm lift surgery. Typically, initial incisions heal within 2 weeks and continue to improve for many weeks. Possible numbness and other side effects usually resolve on their own over time. What are the long-term effects of an arm lift? You must practice diligent sun protection until the healing process is fully complete. It may take a year or more for incision lines to refine and fade; although healing varies between patients. You’ll need to follow your plastic surgeon’s long-term instructions and attend follow-up visits as scheduled. Your arm lift results will be long lasting, assuming you maintain a stable weight and reasonable level of fitness. Though some loss of firmness is a normal occurrence as we age, a healthy lifestyle should minimize that effect.